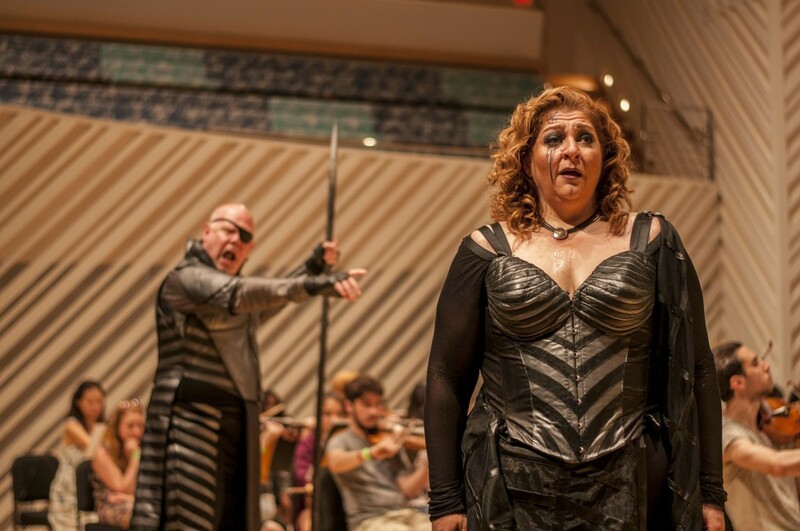 Alan Held and Christine Goerke in Die Walküre, in rehearsal at the New World Center in Miami Beach. It’s been more than 20 years since Miami’s opera company did any works by Richard Wagner, and it’s been even longer for Palm Beach Opera, so it was something of a truly special event Saturday night when the Miami Music Festival gave the first concert by its new Wagner Institute. 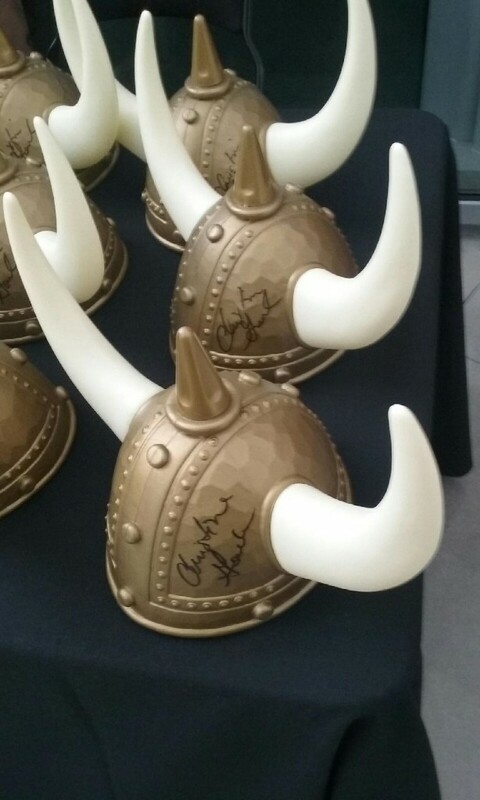 Designed by festival founder Michael Rossi to develop voices for the demands of Wagner and Wagnerian-style opera, the institute officially launched this month under the direction of well-known Wagnerian soprano Christine Goerke (in the lobby, the festival was selling plastic Brünnhilde helmets she had autographed) and coached by Kathleen Kelly, who heads the opera program at the University of Michigan. Rossi, whose operatic background includes work with the Washington National Opera, scored another coup in bringing another eminent Wagnerian, bass-baritone Alan Held, to the concert to reprise the Wotan he sang for Washington National last season. Goerke and Held were featured on the second half of the program at the New World Center in Miami Beach; the first was devoted to Wagner selections by Institute students and an orchestral performance of Richard Strauss’s suite from his opera Der Rosenkavalier. The excerpts began with soprano Tracy Cox in Elisabeth’s Hall Aria from Act II of Tannhäuser (“Dich, teure Halle”). Cox has the vocal bigness for this aria, and she also has enough lightness in her clearly focused instrument to make the joyful sentiments of the text persuasive. Some more warmth would be welcome; perhaps a full run-through of this part could bring that out. Rebecca Wilson was up next with the Liebestod (“Mild und leise”) from the final pages of Tristan und Isolde. Wilson has a dark, strong voice, and she built the aria steadily to its ecstatic end. But she had some wobbly intonation, which didn’t drag her off-pitch so much as it made her phrases somewhat unsure, and that took away from the overall effect. As Erda in the fourth scene of Das Rheingold (“Weiche, Wotan, weiche!”) contralto Rehanna Thelwell made a powerful impression. This is a real contralto voice, one of beauty and distinction, and she sang the Fate goddess’s somber warning with a palpable sense of ominousness. The large audience at the New World Center loved her, and with good reason. Two duets were next, the Siegmund and Sieglinde dialogues from Act I of Die Walküre. In the first (“Ein Schwert vierhiess mir der Vater”) tenor Brent Turner was paired with soprano Jennifer Root. Turner has a nice, attractive voice, and decent stamina, but without the Heldentenor heft one hopes for in this role; still, he sang well and engagingly. Root, whose mezzo coloring added some weight to her singing, was in one important way the best apprentice singer on the stage, with a thorough command of the music and rock-solid accuracy, steady as a beacon against Wagner’s massive, surging orchestra. A second pair, tenor Matthew Opitz and soprano Elizabeth Rosenberg, took over for the next part of the act (“Winterstürme wichem den Wonnemund”). Like Turner, Opitz has a very attractive voice; his is somewhat sweeter and warmer, but also lighter than the tradition would dictate. And like Turner, he sang very well, with the right sense of ardent spirit for Siegmund. Rosenberg’s singing was also quite strong, and her voice has a sharp quality to it that gave it a distinct presence. 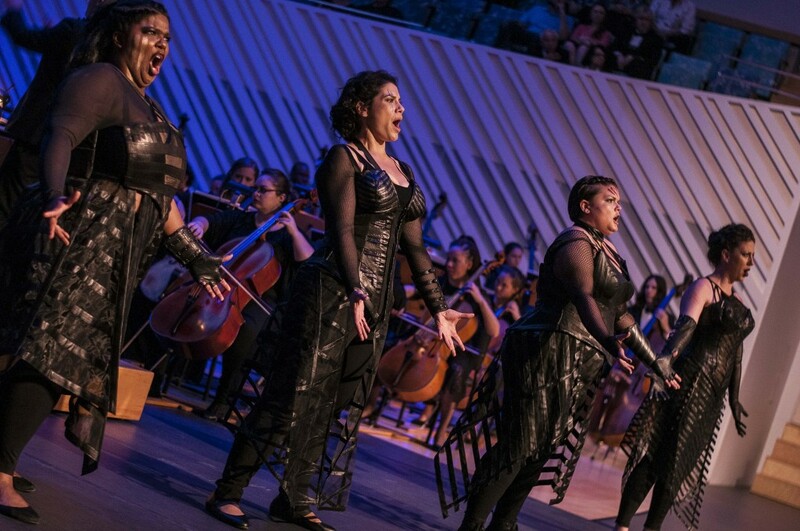 From left: Rehanna Thelwell, Jennifer Root, Elizabeth Rosenberg and Jillian Yemen as Valkyries in Die Walküre at the Miami Music Festival in Miami Beach on Saturday night. Cox took over as Sieglinde in the second half of the program, which was devoted to the first two scenes of Act III of Die Walküre, and Thelwell, Wilson, Root and Rosenberg were joined by four other singers (Jillian Yemen, Stephanie Newman, Lauren Frick and Molly Burke) for the eight Valkyries; Goerke and Held were Brünnhilde and Wotan. There was a semi-staging of the opera at this point, with the eight Valkyries in thrift-shop Gothic with black lipstick; they had the camaraderie of a very tough women’s soccer team, high-fiving each other and celebrating as another of their tribe zoomed in from the wings of the theater. The Seattle Opera’s Dan Miller was the director here, and managed in a tiny space to give some sense of vivid theater. All eight of the singers handled their parts well; in chorus, they gave off a thrilling sound. Goerke’s Brünnhilde was exciting and powerful, with a palpable feeling of desperation as she begged for help in dealing with an angry Wotan. Her voice has the extra weight and force it needs for Wagner, not just for the music itself but for the epic subject matter. Held was equally fine as Wotan, with a mature voice that has plenty of bite and force. Some Wagnerites might like a more profundo sound, but his lighter timbre makes Wotan sound more human. It was a real pleasure to hear him and Goerke square off in this seminal music. The Walküre excerpts dispensed with supertitles in preference for projections of a rocky landscape and something like magic fire, but they were not effective, and it was a pity that the supertitles were not there; it would have been helpful especially for the frantic activity of the Act III opening. The orchestra was excellent, gelling well after their Mahler Sixth the weekend before, and sounding lush, resonant and flexible, as they should. And Rossi turned out to be an exceptional Wagner conductor, someone who seems to have an intuitive understanding for this music’s ebb and flow. He was able to keep the 100 or so players suitably gigantic but not so much that they overwhelmed his singers. The Walküre excerpts were loudly acclaimed by the audience, and Goerke gave the hall an encore: the final pages of Götterdämmerung, well-sung and beautifully played by the orchestra. It was a long evening at the theater, but not for Wagner fans, and the opening selection, the Rosenkavalier suite, was very fine. Rossi is also a good Strauss conductor, logically enough given his penchant for Wagner, and he brought out this music’s special flavor with an expert hand. Oboist Mary O’Keefe did an exceptional job with her time in the spotlight, playing with a warm, soft tone that was well-suited for Strauss’s plump sonic upholstery. Here’s hoping that what Michael Rossi has done is created an annual Wagner night for South Florida. With the major opera companies here not programming any of his works for their seasons, the Miami Music Festival could fill the gap for devotees and at the same time fulfill the organization’s educational mission, training dramatic singers and introducing young orchestral players to crucial canonical music. He has a hit on his hands in that regard, and the debut of the Wagner Institute is much to be welcomed and celebrated. The Miami Music Festival continues tonight with a free program of operatic scenes at Barry University’s Weber Hall, starting at 7:30 p.m., and at 7:30 p.m. Thursday at the Betsy Hotel on South Beach, the festival’s faculty members present a concert of chamber music. Benjamin Britten’s The Turn of the Screw is presented at 7:30 p.m. Thursday and Friday at Barry’s Broad Performing Arts Center, and at 7:30 p.m. Saturday at the New World Center, the orchestra presents a tribute to violinist Ida Haendel, with music by Strauss, a world premiere by Jeffery Briggs, and winners of the festival’s concerto competition. Visit miamimusicfestival.com for tickets and more details.